I quit smoking a year and a half ago today. I originally picked up the habit at my super artsy college, a school that still had “smoking dorms” up until 2007, my senior year. Surrounded by cool kids from New York who would casually drop their stint in rehab into conversation like it was totally normal for any 18 year old, smoking was an appealingly bad-girl thing for this long term good girl to do. Moving to New York City after graduating didn’t encourage me to beat the habit and decamping for Buenos Aires – where everyone smoked, all the time, and cigarettes cost $1.80 a pack – sealed the deal. I was convinced I was going to be a smoker for life (or at least until I decided to get pregnant) until I fell in love with a man who’s allergic to cigarette smoke. With his help and one really awesome book, I kicked the habit in August of 2013. But I know that my almost decade of varying levels of cigarette smoking damaged my lungs. While I don’t know how much it damaged them, I know that I’m going to have to be more careful about monitoring my lung health throughout my life than someone who never started smoking in the first place. So today, on the 1.5 year anniversary of me quitting smoking, I’m excited to share Global Cancer Diagnostics Inc.’s new Lung Cancer Test. 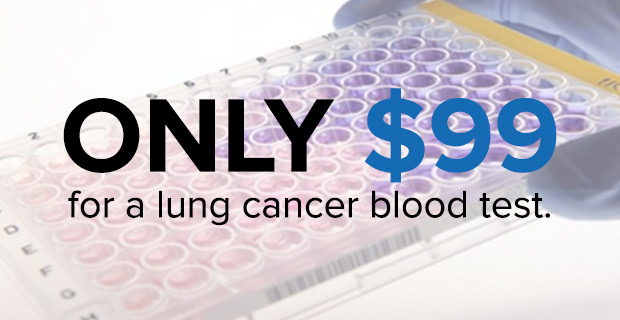 The test costs only $99 and requires a little bit of blood to detect lung cancer, even in the early stages. Considering the fact that catching lung cancer in the early stages is essential for better survival rates, this low cost test (which can be conducted by a blood drawing professional, doctor or otherwise) is a great option for people who don’t have insurance or don’t want to expose themselves to radiation. The Lung Cancer Test has already been tested and validated with a large subject population and you can buy it on the Global Cancer Diagnostics website. The tests are especially recommended for current and former smokers over the age of 50, as the cancer is more likely to pop up in that age range. Global Cancer Diagnostics is also currently raising funds on Fundable, so if you’re an investor who’s interested in lifesaving medical technology, you can check it out here. For the rest of you, if you’re a smoker, take it from me: quitting is not as hard as you think it’s going to be and it’s so, so worth it. Take the time to read Allen Carr’s Easyway To Stop Smoking and reduce the likelihood of needing a Lung Cancer Test in the future.